I've not written much about Harry's life so far, and I know I'm at risk of forgetting what these days are like for us. Much of his first year has just been about survival, making it to the end of each day; I don't feel like I'm making the most of him, if that makes sense. 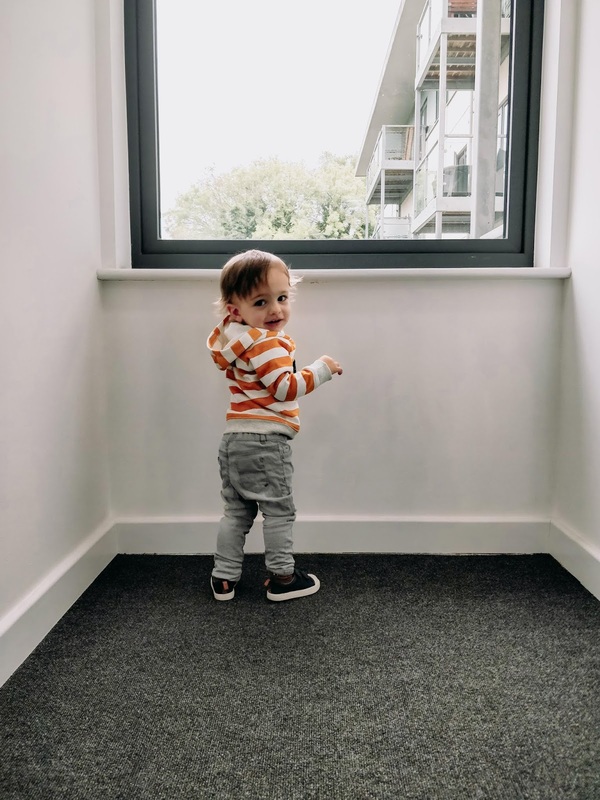 I already know how fast he will grow and change - not so long ago, for example, he had just turned 1 and had just about figured out how to stand on his own - now, he runs everywhere. My tiny black-haired babe has become a little boy with a golden brown mop. After showing signs of teething from around 2 months old, he now has 11, and likes to display them in an almost terrifying grin. He's tall like his father, but skinny with it, and as a result his jeans either fit around the waist, but look cropped, or fit on the legs, but fall down when he walks. 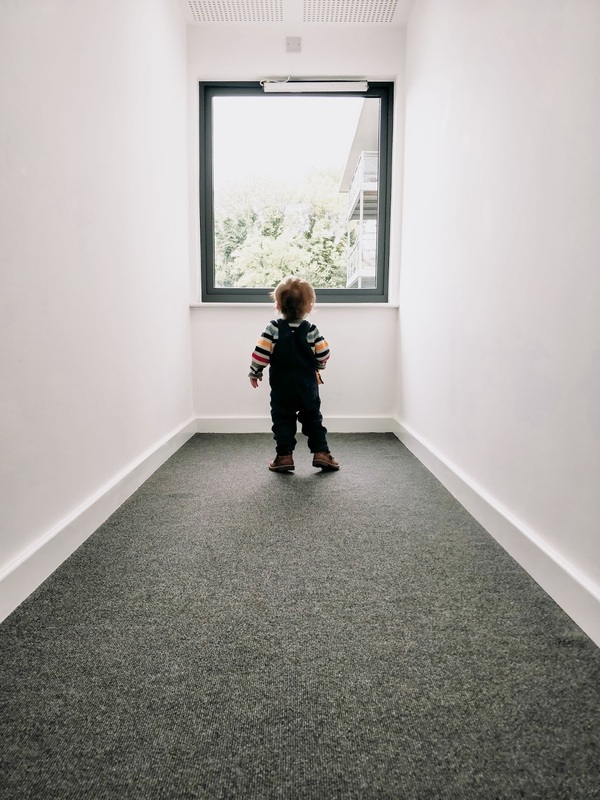 He took his first steps not long after his first birthday, after spending a week with family in Center Parcs where his cousin taught him to walk, and now he doesn't stop, from morning till night! My son must be 90% bread, and loves nothing more than cheese on toast, baby pizza, croissants or eggy bread. He has at least one banana a day and adores blueberries beyond all else. Mealtimes are either fun or frustrating - he will try anything I give him if we are out, and has happily sampled food in Wagamama or Dishoom, but if I cook him food from scratch he will usually chuck it on the floor! My current method of getting goodness into him is serving up some sort of veggie sauce or stew with dumplings, or hiding veg on homemade pizza... Hopefully it's just a phase and he will go back to devouring everything with relish. At least he likes cheese! His daily diet is a little like this: he will have banana and toast or croissant for breakfast, sandwiches for lunch, and his favourite dinner at the moment is fish fingers, sweet potato wedges and peas. He is rubbish at it. Admittedly he naps well, between 2-3 hours a day with a morning nap 2 hours after he wakes, and a second nap after lunch. But despite going to bed with minimum fuss, he won't self settle and wakes frequently after 2am. He'll also only settle for me, so my husband gets to sleep while I become more and more of a shrivelled husk as the days pass by. Recently he's taken to howling the place down when he wakes at night so we are going to finally attempt more rigorous sleep-training attempts - much to my disappointment, as I wanted to keep things fairly gentle and baby-led. But I am desperate for sleep! Harry is a stereotypical boisterous little boy, always charging around, climbing, bashing into things and through people, leaving destruction in his wake - he's quickly garnered the nickname Hurricane Harry. We haven't really pushed him towards any interests as such, and he spends so much time with my niece (they're six weeks apart) that he is exposed to such a huge range of toys, yet he has become absolutely fixated on cars (and Pixar's Cars, sadly). It's just odd isn't it?! Saying that, he has finally developed an interest in books and will happily flick through them (after pulling every single tome he owns out of their box and on to the floor, obviously). He has a couple of favourites which we have to read and sing along to every night, and when we visit Waterstones he's always keen to pick out a book (recently a book in the shape of a digger, and one on trains... what is with the transport obsession?!). He's also a fan of dinosaurs and happily roars when he sees one in a book or on TV. Harry has picked up a couple of words - aside from Daddy, Nana, Grandpa etc (he calls me Da which is soulcrushing, I have to say) his favourite word is dog (mostly pronounced "gog" although he has improved) and he loves to point them out. He can also say "car" or "brum brum" and points them out in his books or when he's playing too. I've been trying to teach him words for when he is hungry or needs his nappy changing, with a view to potty training one day, so he has just started saying "bum bum" when he needs a change (!!). Other words are quite sporadic - he sometimes repeats stuff, and once asked me for a "narnah" (banana) for breakfast, but mostly he just babbles away, or points and shouts. He'll sometimes say "cheese!" for a selfie and has finally mastered how to say and wave bye at the right time, rather than 5 minutes after we've left anywhere. On that note I'll say bye myself, as I'm aware I've just written an essay about my son and it's probably of no interest to anyone but my future self... so, future Dani, in 6 weeks' time, when you've forgotten what life was like with a 15 month old, I hope this brings some of it back!